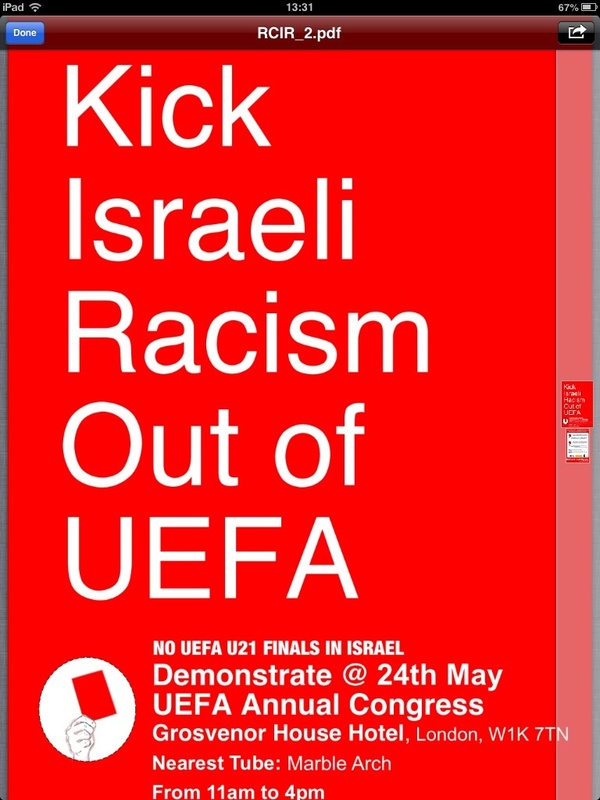 The Red Card Israeli Racism campaign is escalating its activities as the June 5-18 dates for UEFA’s under-21 men’s football final in Israel draw near. The London-based campaign is now part of a European coalition of groups working to expose the folly of staging a major competition in a state which shows contempt for the rights of Palestinian football players and supporters. Beyond June, Red Card has the potential to develop into a long-term challenge to Israel ’s membership of UEFA – the overarching body for European football. The June tournament will probably still go ahead, but the case against it has gained prominence over recent months. Frederic Kanoute and 51 other leading professional players issued a statement deploring Israel ’s attacks on Gaza in November, saying they called into question holding the games in Israel . In January, a well publicised action at the UEFA offices in Nyon , Switzerland , forced UEFA president Michel Platini to give pro-Palestinian protesters a hearing after two years of turning a deaf ear to the campaign. In March, the congress of the French trade union CGT-INRA passed a resolution contesting UEFA’s decision to stage the competition in Israel and a former French minister of sport, Marie-George Buffet, wrote to Platini calling on him to hold it elsewhere. In the UK , football media are opening up space for discussion of the issues, such as this piece on the FootyMatters website, written by members of the student group Football Beyond Borders. It prompted a reaction from the Jewish Chronicle, insisting that UEFA would “stand firm” against our campaign. FBB has held two well-attended public meetings in London to mobilise support for the campaign. The Red Card petition now has 6,500 signatures, and rising. The UK will become the focus of intense campaigning action as UEFA holds its annual congress in London on Friday May 24. A major demonstration is planned for the occasion. The men’s and women’s Champions League finals will be taking place around the same time and Friends of al-Aqsa are organising a 16-plus anti-racist tournament in east London – Goals for Peace – for up to 20 six-a-side teams. Mahmoud Sarsak, the national Palestinian team player whose release from unlawful detention we campaigned for last Spring, plans to be in England at that time as part of an extended European tour. He aims to visit Norway , Spain , France , Italy , the UK and Ireland between April and June, meeting players, officials, fans, politicians, journalists and activists. The intended dates for the English leg of his tour are May 16-26, visiting Scotland until June 8 and moving on to Ireland before returning to his home in Gaza later in the month. The campaign is working to build support for the tour through mainstream organisations such as FARE (Footballers Against Racism in Europe), Kick It Out and Show Racism the Red Card, trade unions and faith groups, as well as pro-Palestinian and human rights bodies. Red Card Israeli Racism was established in London in 2011 by members of PSC, Friends of al-Aqsa and Jews for Boycotting Israeli Goods. It currently (March 2013) has a steering group representing those organisations but is inviting much wider participation to build a sporting boycott campaign alongside other BDS groups around Europe . Got all that? Good. But just in case you didn't get all that, here's the Red Card Petition link again and here's a link to the Red Card Israeli Racism website. Jonathan Hoffman: We are all Ronnie Fraser! Socialist Workers Party (UK), 1950-2013 R.I.P.